The Flying Spotted Jellyfloat is a jellyfish-like enemy in Hey! Pikmin. It is blue with 2 lines of spots (hence the name), and is slightly transparent. There are two yellow eyes sticking out of its head, and a small turquoise orb at the bottom that can crush Pikmin. It is about two times Captain Olimar's height and width, being the smallest member of the jellyfloat family. It appears in only one area, Downpour Thicket. To do: Find the health value from the game files. 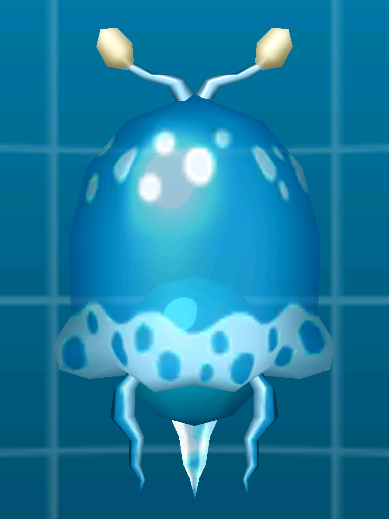 Flying Spotted Jellyfloats levitate around and make a noise, and fall to the ground when either Olimar or any Pikmin are under it. Pikmin will die if they are under it as it hits the ground. If Olimar defeats a Flying Spotted Jellyfloat, it will drop 2 Sparklium Seeds and another one will soon appear. However, every one that comes afterwards will drop nothing. It can be assumed that the creature is mostly found in moist environments, because its location is full of dew. It is also found very commonly in this area, although its not found anywhere else. Downpour Thicket: This is the only area in the whole game where they can be found. They mostly act as an additional threat while dew droplets stun Olimar. They can be especially harmful near the end with the trowel, since the player must multitask knocking over the trowel and dodging dew droplets, as well as warding off the creature. Hitting a Flying Spotted Jellyfloat with any Pikmin will defeat it. It can only be attacked when it hits the ground, however. The best thing to do is to lure it in by walking directly under, and then throw Pikmin at it. It will only take about 15 hits to kill, rewarding you 2 Sparklium Seeds. It is then advised to leave quickly, as soon another one will appear and can cause trouble. The English name, Flying Spotted Jellyfloat, probably comes from how it flies very high, higher than any other jellyfloat. "Spotted Jellyfloat" is the used in other members of its family. Like all Hey! Pikmin internal names, it is a Romanization of the creature's Japanese name with no spaces. However, its generator name is enemy_glider_loose. This is probably because of its behavior: it glides around loosely. Also, the ball inside of it seems to be slightly loose. Particularly: Fill in the meanings. A Flying Spotted Jellyfloat falling. A Flying Spotted Jellyfloat on the ground. A Flying Spotted Jellyfloat in the creature log. This page was last edited on March 5, 2019, at 14:18.